Brian LeBlanc of Newtown sinks a putt on the 9th hole at Ridgewood Country Club in Danbury during the South-West Conference golf championships Friday, May 25, 2012. Max Catucci gave the Weston boys golf team a chance to repeat as SWC champs Friday at Ridgewood Country Club in Danbury. Catucci was the medalist by shooting a 75, four over par, beating out Pomperaug's John VanDerLaan (77) and Derek Domogala by two strokes. 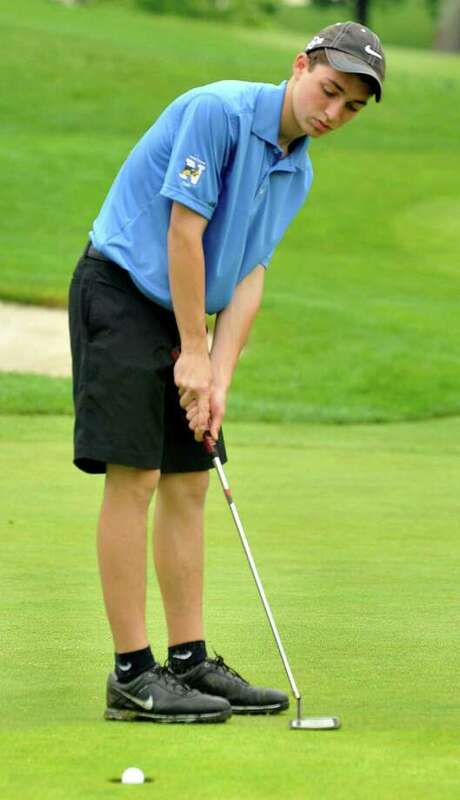 However, Pomperaug won the SWC title, edging second-place Weston by two strokes, 323-325 in the eight-team field. "It feels pretty good being the medalist," Catucci said. "It eases the pain of not winning today." Trojans coach Brandt Nigro said, "Max did great today." The day before SWCs, Catucci and Joey Klokus combined to shoot a 73 at the Chappa Tournament in Westport. He wasn't pleased with his performance and decided to take a corrective measure. Following his performance at Chappa, Catucci went to Rolling Hills driving range with teammates Jared Kapel and Nigel Poppy, which helped him. "I was on the range, working on my mechanics and something clicked," Catucci said. "It definitely helped because I felt the change come overnight. If I didn't go to the range, I wouldn't have done as well." Going into the championship match, the Pomperaug Panthers were favored to win. Pomperaug was the only team to vanquish the Trojans, who were 14-2 during the regular season. Moreover, Weston didn't have any seniors in its lineup. "We were definitely the underdog to Pomperaug," Nigro said. "We were hoping to upset them, and to lose by only two strokes is pretty good." Catucci said, "Even though there were no seniors on the team, we still expected to win it." Meanwhile, Nigro's counterpart, Pomperaug coach Rich Szymanski sat beside the SWC trophy and charged with the task of tabulating who was going home with it. Szymanski let it be known that he didn't want to know until he absolutely had to know. Little by little, group by group, the scores trickled into the SWC tournament director's official scoring area at Ridgewood Country Club Friday morning, where he meticulously penciled, then inked them onto the official scoreboard. And as another neck and neck finish with rival Weston grew more and more imminent, Symanski found it harder and harder to separate his duties. "They should have somebody less invested doing this," Szymanski quipped. Finally, once it was time to calculate the team totals once and for all, Szymanski looked to his star VanDerLaan for an assist on the calculator. Though he should have known all along that the Panthers were in the clear. It's the Panthers' eighth overall title and first since 2008, bettering the Trojans' total by one. It was also assured in advance by Domogala, who's got an almost comical knack for the clutch. Klokus (81), Asher Greenberg (86) and Kapel (87) rounded out the field for Weston. "We won four of the five matches, the one we lost was by a big margin," Nigro said. "Overall, the kids should be proud and it sets us up well for states." Catucci said, "If you told us we'd shoot a 325, I would have been happy and thought we'd win. Pomperaug had a great day today. Anyone who shot under 80 as an individual did well." The Trojans will compete for the Division III title Monday at Crestbrook Park in Watertown. They placed third at states the last two years and won the Division III title in 2009. "Our goal is to always win states," Brandt said. "Our differential is eight better than last year." Catucci said, "This will push us and make us hungry for states. I talked to my co-captain Jared Kapel, and although we're disappointed to fall short at SWCs, we'll work hard and hope to win a state championship."